Silk Road favorite! 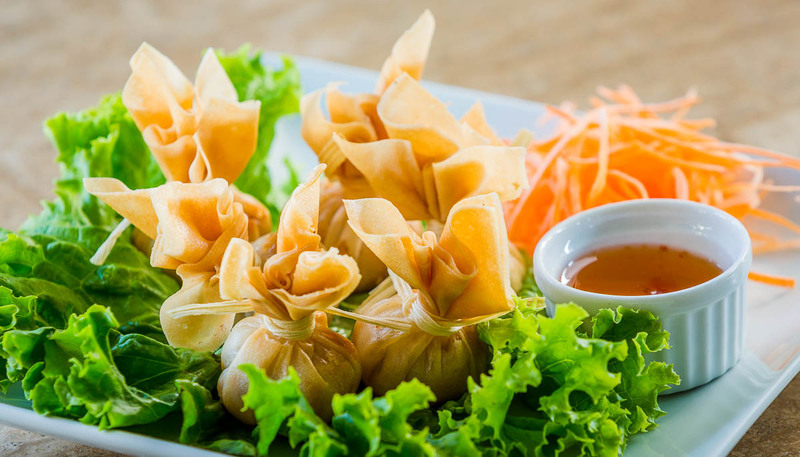 Mixture of fresh vegetables, glass noodle, and Thai herbs wrapped in pastry and deep-fried to golden brown. Served with sweet and sour sauce. Yummy combination of crab meat, bell peppers, and cream cheese wrapped in pastry and deep-fried to golden brown. Served with sweet and sour sauce. variety of fresh vegetables lightly breaded in tempura batter and fried to golden brown. Served with sweet and sour sauce. Combination of chicken and vegetable wrapped in potsticker wrappers. Served with house special soy sauce. Tender calamari lightly breaded in Japanese styled breadcrumb and deep-fried. Served with sweet and sour sauce. Fresh corn marinated with Thai herbs, breaded and deep-fried to golden brown. Served with cucumber salad in sweet and sour sauce, topped with crushed peanuts. Fresh marinated shrimp wrapped in pastry and deep-fried until crispy. Served with sweet and sour sauce. Steamed Japanese soybeans served with a pinch of salt…simply delicious! a thick, earthy, aromatic curry sauce simmered with coconut milk, peanut, potato, ginger, onion, bell pepper, carrot, and your choice of meat. Served with steamed rice. Crispy fried tofu atop variety of fresh vegetable. Served with peanut sauce. A creamy coconut milk and lemongrass based soup with mushroom and your choice of chicken, beef, pork, tofu, or vegetable. A creamy coconut milk and lemongrass based soup with mushroom and shrimp. A creamy coconut milk and lemongrass based soup with mushroom and your choice of chicken, beef , pork, tofu, or vegetable. A Thai traditional lemongrass based soup made with aromatic Thai spices and herbs, mushroom, tomato, and your choice of chicken, beef, pork, tofu, or vegetable. A Thai traditional lemongrass based soup made with aromatic Thai spices and herbs, mushroom, tomato, and shrimp. Deep-fried catfish topped with fried garlic. Served with steamed broccoli, house special lime sauce and steamed rice. Deep-fried catfish topped with mixer of ground chicken, bell pepper, lemongrass, and red onion simmered in coconut milk and soybean sauce. Served with steamed rice. Silk Road signature…crispy fried shrimp topped with tamarind sauce and fried onions. Served with carrot, broccoli, and steamed rice. Deep-fried catfish topped with mixture of red coconut sauce, carrot, bell pepper, bamboo, and eggplant. Served with steamed rice. Marinated beef stir-fried atop steamed carrot, spinach, and bean sprout in house special sesame soy sauce. Served with steamed rice.